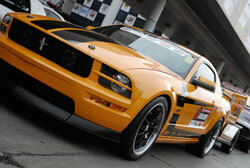 The bright orange 2007 GT Mustang parked on the floor of the 2012 SEMA show symbolizes many things to many people. To 19-year-old Jarrod Holly, the car's owner, it represents a lifetime passion for drag racing, hot rods and in fact anything with an engine. To Ethan Holly, Jarrod's dad, it embodies a deeply emotional bond between himself and his son. And, for everyone that saw the car at SEMA, or watched it drive by on the 2012 Hot Rod Power Tour from Detroit to Arlington, Texas - it will forever stand for the symbol of a hero. The bold black double-strips dividing the Ford in half extend over the matching orange trailer where Jarrod stores his wheelchair. Jarrod was diagnosed with Duchenne muscular dystrophy when he was 7, and he's been battling it with grace and dignity ever since. Doctors aren't optimistic he'll live past 25. True heroism is staggeringly sober and remarkably undramatic. Ethan would be the first to say that his son doesn't see himself as a hero, and that he doesn't let the disease get him down, he goes about his business and doesn't complain. It's been said however, that heroes are people who involuntarily answer a calling with unfathomable courage. They transform compassion through their personal virtue, into heroic action, which then becomes a public virtue. By definition then Jarrod is nothing short of a hero. 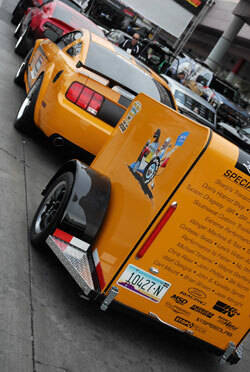 The 2012 show was the Holly's second SEMA visit, but the first time they displayed a vehicle. 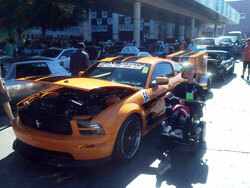 Ethan sites the SEMA show and being able to take his son on the Power Tour as two of his prouder moments. "We have been planning and working on the vehicle since the beginning of the year (2012).This vehicle started out as a project for the Hot Rod Power Tour," explained Ethan. This involved a trip to K&N so that they could design and test out a cold air intake system for our particular set up. This was a tremendous effort involving many phone calls and communications to line up sponsors, products, and completing most of the modifications on the vehicle itself. Since my son and I did most of the installations and modifications on our own, this involved a lot of blood, sweat, and meeting deadlines. I did the grunt work and my son read the instructions to me to keep me on track. 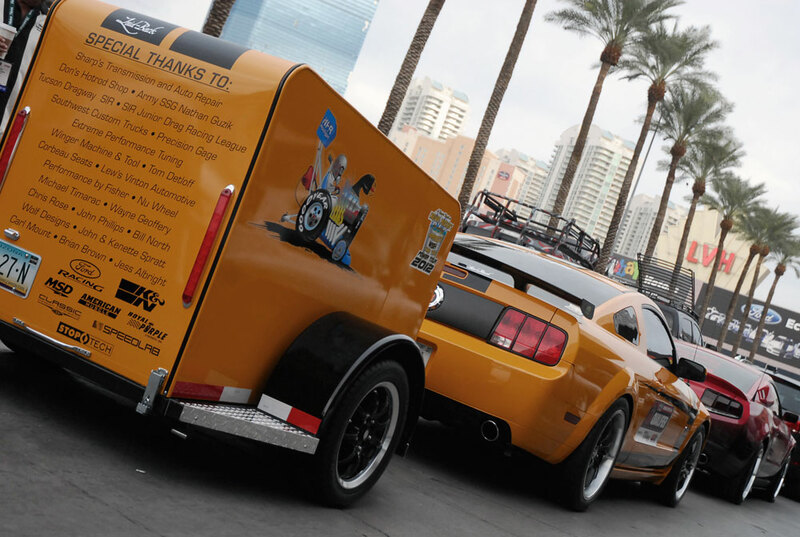 When K&N let us know that we would be displaying the car at SEMA, it was another deadline to meet, with much organization work involved to make sure Jarrod's Mustang and wheelchair trailer was ready to go after a long road trip on the Hot Rod Power Tour." 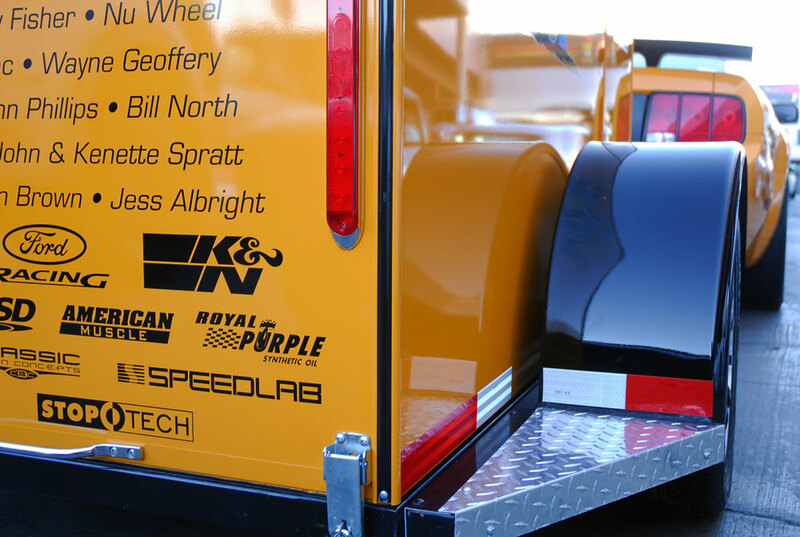 Ethan has been a loyal K&N fan for over 15 years, that's when he bought the first air filter for his truck. That's why it was such a fortuitous encounter when Ethan met with Devin Rickey, Sr. Manager of Special Projects for K&N Engineering. "I met Jarrod and his father, Ethan, at the 2011 SEMA show through a mutual friend," commented Rickey in an earlier story (K&N Joins 19 year-old Jarrod Holly's Quest for Bucket List Power Tour). "After hearing about Jarrod's plans to participate in the Hot Rod Power Tour and what he wanted to do with the car, I thought that there is an opportunity for the aftermarket community to help this young man's dreams come true." This is the Vail, Arizona father and son team's first build together, although they share their extensive background in drag racing. "My specialty is building drag race cars," said Ethan, "Although I have enjoyed putting together this project for my son. I consider the Mustang to be a street machine project." Their goal for this year is to participate in the Hot Rod Power Tour 2013. Jarrod is determined to do the Hot Rod Power Tour as long as he possibly can. "Other plans include car shows, cruises, and drag racing," Ethan adds. 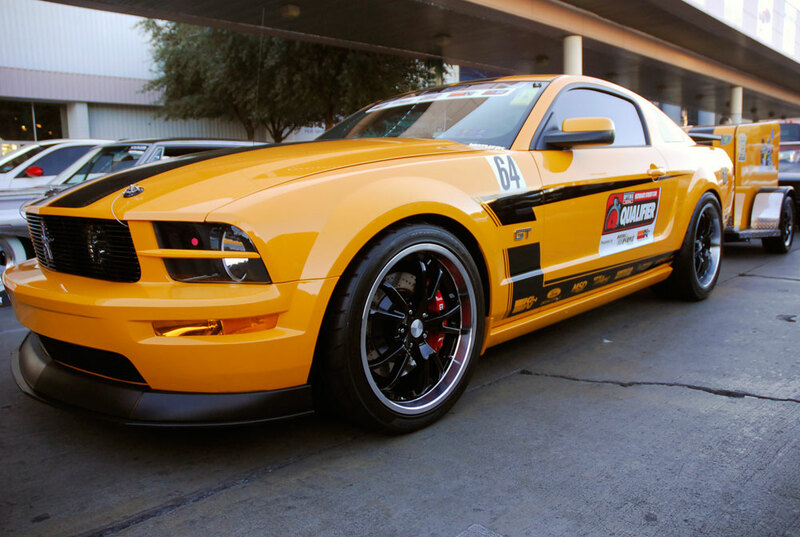 "He is also considering doing another Optima Batteries Ultimate street car challenge." "We want to give a special thanks to K&N for everything they have done for Jarrod and his car. And special thanks to Devin Rickey in having a vision for making all of this happen. Our plan is to create a hot rod wheelchair van to use as a support vehicle for Jarrod's medical equipment, and will be keeping you updated on its progress." CDC- Classic Design Concepts after market body parts. Jarrod Holly's Mustang inspires people in a range of ways everywhere it travels. Drivetrain: Custom computer tuned transmission, aftermarket axles and gears (3.73) to create a stronger setup.